The only nation born in a day; the only country that appears on mainstream media almost every day; the only country filled with controversies throughout history--this is Israel. Although an array of people possess rather negative attitudes toward this country, israel is still a strong and influential nation.While having territory disputes with Palestine, Israel remains a place where people love to spend their vacations and do their research. In the book of Deuteronomy, Psalms, Proverbs and lots of verses in the Bible, Israel is always mentioned as the apple of God’s eye. These scriptures tell the importance of this country, which is especially true for me after seeing it with my own eyes during my 2-week-stay in Israel. ​The only nation born in a day; the only country that appears on mainstream media almost every day; the only country filled with controversies throughout history--this is Israel. Although an array of people possess rather negative attitudes toward this country, israel is still a strong and influential nation.While having territory disputes with Palestine, Israel remains a place where people love to spend their vacations and do their research. I felt particularly grateful to visit this amazing nation and to get an insight into it during their 50th anniversary of the Six-Day War, one of the most well-known wars in history that Israel won with only a few forces after fighting with Arab troops for only six days. This war signifies a critical moment when Israel took the Gaza strip, the West Bank (incl. East Jerusalem) and the Sinai Peninsula and the Golan Height back into their control. Ammunition Hill and the Tank Museum are two main sites where I learned more about this crucial war. The Ammunition Hill is the place where Israeli soldiers fought with Jordanians. It is also the venue of one of the fiercest battles due to its narrow trenches. When I was there I stepped down into the trenches to get feel of how narrow they were. Walking along the trenches is like you are trapped in a maze. You are forced to keep going because your fellow soldiers are right behind you. Yet, at the same time, you don’t know what is in front of you for the path would suddenly turn left and then right. The death toll for this battle was high. Before we went to Ammunition Hill, I also visited the Tank Museum to pay my tribute to all the soldiers who sacrificed their lives in the battle. However, we were not the only ones there to cherish the memory. Many local people also revisited the Museum to once again reflect on all that their country has gone through, all the ups and downs, but still standing firmly today. 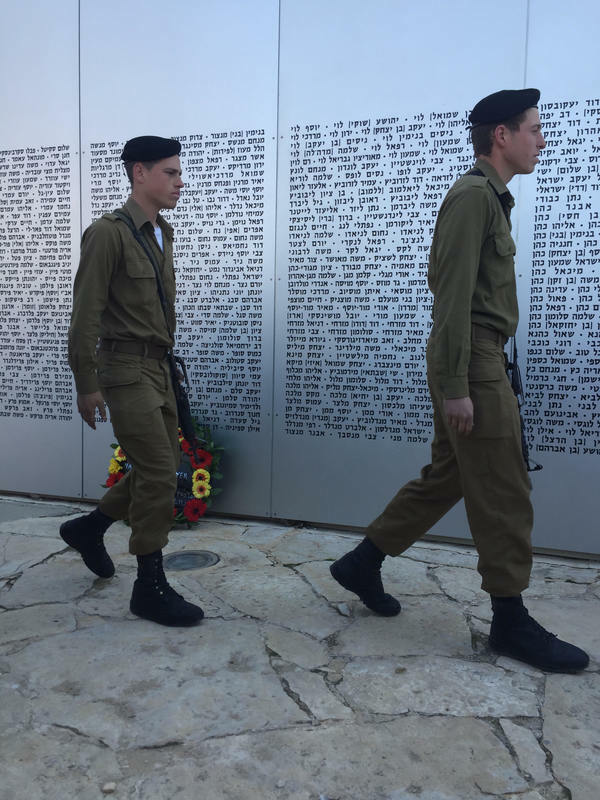 We also sang their national anthem Hatikvah together with their soldiers. Hatikvah literally means “Hope”, declaring the hope of the country despite difficult situations. Looking out the original trenches of the Jordanian army twisting on Ammunition Hill not only reminded me of the hand-to-hand battle won by Israel, but the current Israeli mandatory military service. In Israel, both males and females are required to serve in the military for two to three years. After they finish the service, they may be recruited at any time whenever the country needs them. The Israelis love their nation and every one of them is so proud of their country, even willing to die for it. In my opinion, this is something very different from Taiwan attitudes. In addition to the famous Israeli forces, Jewish people are also always labeled as high intelligent. It might be true, as according to the data, over 20% of the Nobel Prize winners are Jews, albeit there are only 0.2% of world’s population is comprised by Jewish people. Speaking of Jerusalem, Israel, one cannot leave out religion. There are four sections in the Old City in Jerusalem, which are the Jewish Quarter, the Armenian Quarter, the Muslim Quarter and the Christian Quarter. I only entered the Jewish Quarter, hence I could not compare and contrast these four divisions. However, from the four sections already shows the complexity of religion from this one small site of Jerusalem. Jerusalem has been considered to be a holy city in three religions which are Judaism, Christianity and Islam. On the first day of the trip when I was roaming around the Old City, suddenly, the Muslim prayers started broadcasting as it was the time to worship Allah, while the other religious groups who were also in the area singing their praises to God. I feel that even though they were not combined as one, the three different religious groups still try to respect each other and to live harmoniously together in Jerusalem. Speaking precisely, they are all worshipping the same God but in different forms and rites of worship. For me, it is hard to put all the feeling of living in such a multicultural and multireligious country into words. It is extremely fascinating yet complex. In Psalms 122:3 of the Bible, it says, “Pray for the peace of Jerusalem: they shall prosper that love thee.” This verse already shows how controversial this place was, is and will be. People need to pray for peace in Jerusalem. Furthermore God promises whoever loves Jerusalem will prosper. As I walked down the historical sites, the whole Bible suddenly came alive in front of me. From the trip to Israel, I discovered the real Israel, which was not exactly the same images depicted by the medias, but rather a country God even named as the apple of his eye.